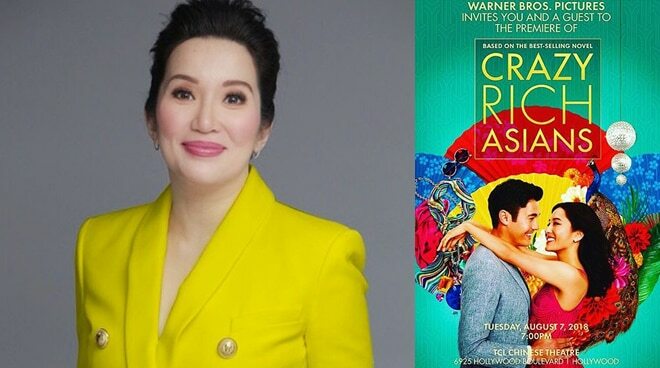 Kris Aquino excitedly shared that she received an invitation to the Hollywood premiere of "Crazy Rich Asians." Kris landed a role in the international movie, which she started shooting on June 14, 2017. Kris recounted, "I was at practically back to zero when i auditioned for this film March 25, 2017. Sumugal na dahil ang pakiramdam po walang mawawala... Na shock dahil June 14, 2017 nag start mag shooting na... Bawal pa rin mag reveal nung role ko (waiting for the go signal of @wbpictures when we can release some pictures of me in costume kasi pag nakita na yung gawa ni @michael5inco medyo giveaway na po) pero para po sa karangalan nating mga Pinoy- napakalaking ‘boost’ ito." The actress-host shared that she is just waiting for the go-signal from a brand that she is endorsing for her to attend the event. "I have been greatly blessed because my US based agent @agentchrislee sent me the official invitation & i am excited to see @kevinkwanbooks again- kailangan na lang po ng permission ng isang super big food brand dahil may 3 day endorsement shoot for them na matatamaan. #kapitlang #lovelovelove," Kris wrote.